Unique bingo cards printed onto a glossy cardboard finish. These cards are durable and reusable. 100 unique bingo cards printed onto a glossy cardboard finish. Perfect for a small game of bingo! 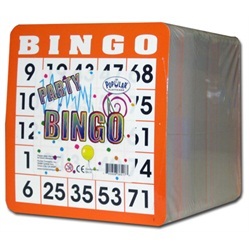 300 unique bingo cards printed onto a glossy cardboard finish. Perfect for a larger group of bingo enthusiasts.